sock prØn. : One fish? TWO fish! My favorite fish story from my grandpa... He came from a family of 12 brothers and sisters (!! ), and the brothers loved to fish as much as he did. He and two of his brothers, and all of their sons (including my father, age 7), got up in the dark of morning, got dressed, headed to the all nite diner for a 3am breakfast. The boys (my father and his cousins) were stuffed to the gills with pancakes, waffles, all of the sweet breakfast foods while the adults sipped coffee, waking up for a long car ride. Clamboring on the boat, the kids were bundled against the cold but not against the rocking of the boat... on the ocean face, sick kids leaned over the boat rails and purged their sickly sweet breakfasts into the water, supposedly attracting fish for the catch. My grandfather said it was cheaper than buying the chum at the dock. Yes, it was on purpose. No, my father doesn't fish now. Hm, did I say two fish?? hm. maybe i took it too far that time. Anyway. Third verse, same as the first-- the Trekking yarn (coloway #100!) seemed to make it fly off the needles as well, I was just fascinated watching it change over the "scales". It is a *warm* sock yarn, I don't know why but it feels like it will be warmer than any yarn I've used so far, interesting. It's not a soft yarn, not like the merinos, but just fun to watch knit up (not scratchy, but not soft being knit... not sure about after the wash). I found a few spots of overtwisting, but nothing that didn't even out over a few yards. I thought it would be splitty with the distinct plys of yarn and all, but no-- I didn't have any problems at all with it. I also had a lot of yarn left over-- I kept the sole at 36 sts (instead of 32) for a slightly wider foot, and did 3 repeats + 5 rows of chart B for the foot length (10.5" incl. 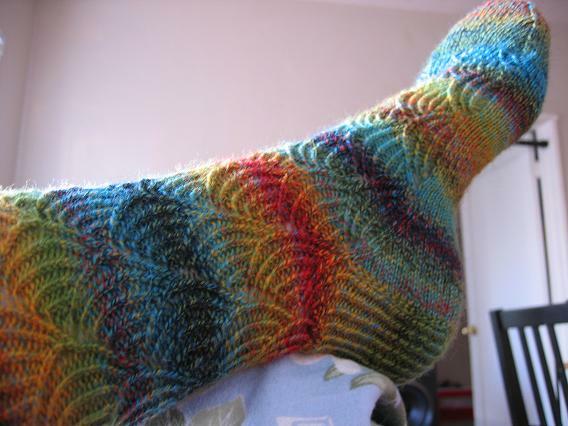 toe, that was longer than the patt given the larger # of sts), and still had 16 gm of yarn left over. I used the Holz & Stein ebony dpns I reviewed when knitting them up, US 1.5 (2.5mm). Tell you a secret, I didn't swatch this time-- I knew how stretchy the pattern was and that I was planning on adding a few sts @ the sole for a wider foot, so no worries-- I just dove in. I just measured the stockinette sole: 8 sts/inch and 11 sts/column inch on US 1.5 dpns in the round. I like the fabric it made. You make me want to knit another pair, too! P-word socks looke great...again! Holy crap, I love that bag and must make myself one. I love that freakin sock fish bag thing!! 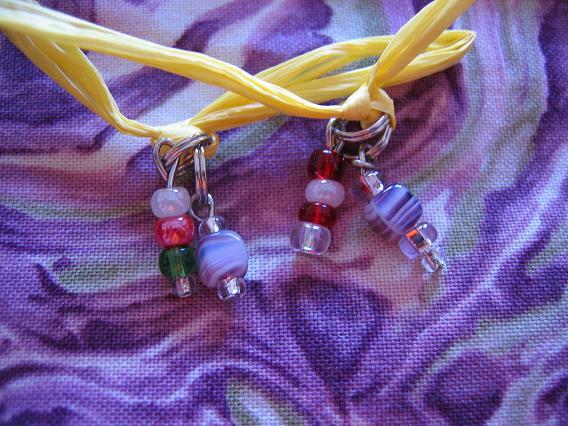 I can't sew, but that makes me want to learn! I totally noticed Thomas in the pic before the socks even got a glance. We are total Thomas nuts at our house! Very very nice. The trekking looks great with that pattern. Your P socks are stunning! Stunning. Stunning. Could you knit your socks in the other direction so the lace points the right way? Great use of Trekking 100! Love the P-word socks. And loved the fishy bag and fishy story. I absolutely love how those socks turned out. The colors and the pattern work so nicely together! Love the fishing story too! I love the socks! I think that's my favourite colour of Trekking, and it looks so good as pomatomuses! I love that Thomas is on in the background of one of your photos! As the mom of a 3yo, I can sooooooooooo relate! Of course, I love the newest embodiment of your P-socks. Trekking--Love. It. Since the Trek Along with Me started, I have seen so many new colors that I want. I already have a very plain pair in the 100, and they are one of my fav socks. I have some 105 to knit up--and saw a color that is similar to the 105, but more vibrant--must find out the # because I need some of it! Lovely socks! Such a cute bag too. Glorious socks as usual. How do you knit them all? I think you're hiding the fact that you can also knit with your toes. I am also the proud owner of a Zonda sock fish bag. I took a project out in it and everyone was going nuts over the bag!! Those socks are fabulous. I have to try anything that challenging in my sock adventures yet. Wonderful fish all the way round! 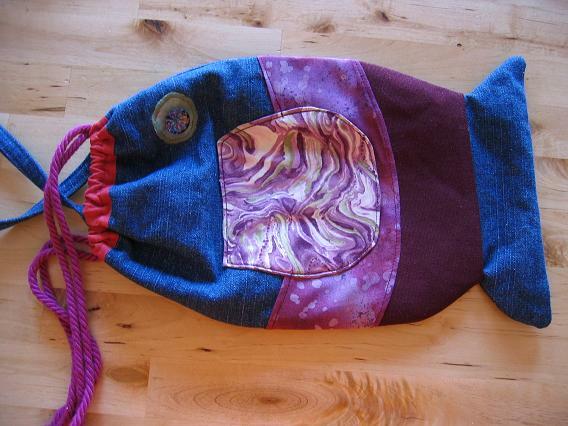 The fish bag is really cute, and I love the way Trekking stripes up to make ..... Rainbow Trout! Zonda is such a sweet person!!!! Love your bag & socks,, even with Thomas the Tank in between was tooo cute! Love your socks!! 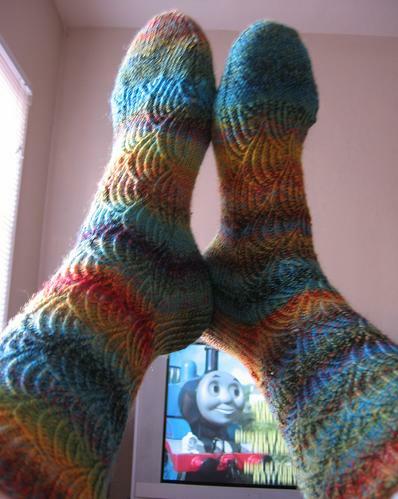 Yeah, inquiring minds do want to know if you knit w/your toes ;) hehe! Those are my fave of all of the P-socks I've seen so far. Really smashing! Those Pomatomi came out gorgeous! I loved that pattern when I made it back in February. Now I'm inspired to make more! In Trekking! I love your sock fish!!!!! The P's came out great - glad you finally decided on that pattern! Love your sock! Love the funny fish story, LOL! And love, love, love the fish bag. What a nice gift you got. Really!! 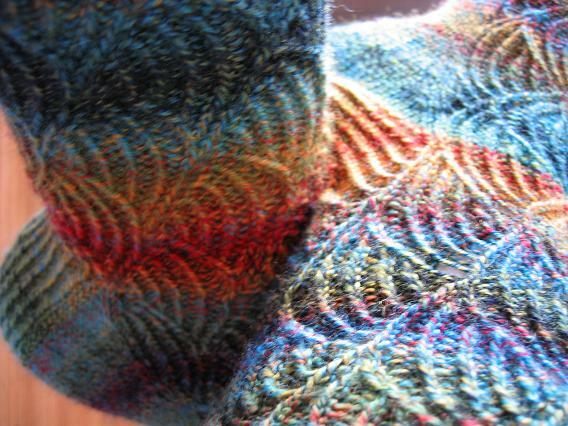 Anne is right about the leaf motif ... switch the direction that you knit your socks. Otherwise, the book "A Treasury of Knitting Patterns" by Barbara Walker has a nice leaf [point side down] on page 217. Called the "Drooping Elm Leaf" and it's in a multiple of 15 plus 1 ... so 31 will include a repeat. See if your town Library has the book. Good luck! Lovely sockies! And a cute bag too! I really like that sock pattern. I might have to try a pair of those after I finish the RPMs I am working on now. Love the RPM pattern btw. The spiral pattern is nice and easy to do while I am watching tv or otherwise engaged. Thanks! I love that pattern, too. They turned out gorgeous! Love the fish bag. Too cute. I think Cascading Leaves is pointing down. Pomatomus in Trekking XXL is so delightful. It really shows the subtlety of the yarn. The textured surface gives a nice play of light on the color changes. Its great. I also adore Trekking XXL. I could not put it down the first time I used it. And hello Thomas! You are a very useful engine indeed........ Helping to show off the lovely socks!!
" Third verse, same as the first" = I'm Henry the VIII, I Am? Leaf-motif lace pattern "branching out"
Your story about fishing was so tranquil and comforting, up until the barfing part! LOL! You write very well. I enjoy reading your blog a great deal. I have ditched mine in order to concentrate more on the very very needy and tiring 15-month old and his older sister, but I promise to still read yours! I need my fix! THANK YOU! I LOVE THEM! I haven't test driven them yet, but will soon! Those are gorgeous! 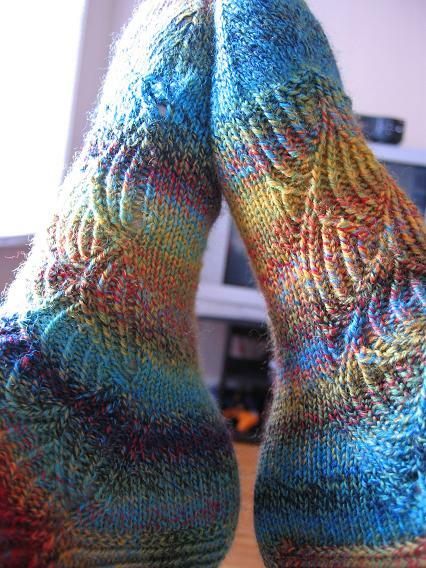 They're my favorite of the 3 pairs you've knit. I think that pattern is next on my sock list. Oh Wow! The P-word socks and trekking 100 are a match made in heaven. That is the best use of that particular colorway I have ever seen. I have the yarn now I know what pattern to use with it. Your socks are just great! Love the fish bag, So original! Beautiful yarn and OMG the wonderful job you did knitting! I especially love the picture you captured of THOMAS THE TANK ENGINE in the background! He was my DS's hero for a few years! Thanks for the wonderful pix! Great JOB! Love the cute fish bag. 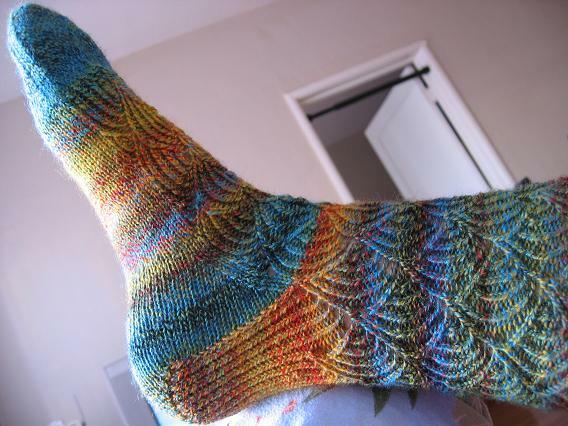 The P socks are gorgeous, but caused me to have a flashback to all those twisted knit stitches. One pair is enough for me! Your name means "fisherman" and you have the blood of fishermen running thru your veins,that's mean you can also fishing like you father. I'm loving your soft and cozy socks! In general, your hand made works look more than simply great!My congratulations to you! Your ideas often inspire me... But I now need to complete my home work as it is due tomorrow! So, I'm leaving! See you! Saw this in the NYT today and thought of you... As near as I can tell, you're impossible to communicate with, so it goes here.